Shirdi is a small town and an everlasting place for rejuvenation lie on the Ahmednagar- Manmad highway. Located around 307 km northeast of Mumbai, Shirdi is a home to a great saint, Sai Baba who lived her for around eighty years before he went into his Samadhi. 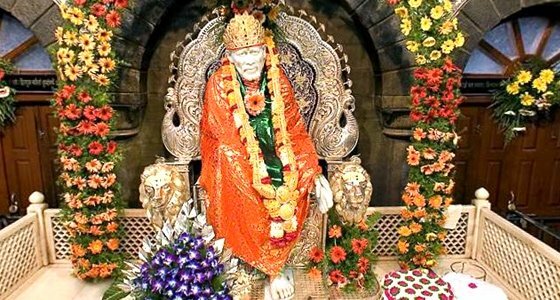 Apart from Sai Baba temple, other places of interest in and around Shirdi include Dwarkamai, Chavadi and Shani Shingnapur. At Tour My India, we offer a weekend tour to Shirdi that will take you to one of the famous holy destination of India. Every year, lots of pilgrims visit this place to offer their prayers to the great legend Sai Baba for his mercy. So, be ready for our Shirdi Weekend Tour and make your weekend interesting. Meet on arrival at Mumbai Airport / Railway station and drive to Shirdi. Shirdi Sai temple is a beautiful shrine that was built over the Samadhi of Shri Sai Baba. Shirdi is famous temple of Shri Sai Baba. It was established in 1922 to carry out the services of Shri Sai Baba. At age of 16 yrs Shri Saibaba arrived at the village of Shirdi in Ahmednagar district of Maharashtra and remained their till his death. Saibaba found shelter in Khandoba temple, where a villager Mahalsapathi in the temple addressed him as Sai or Saint Sai baba. Arrive at shirdi check in at hotel. Evening free at leisure, Overnight stay at hotel. Early morning proceed for sai Darshan / kakad Arti ((optioal). After breakfast visit to City tour of Shirdi, Like-Dwarkamai, chavadi, Shani Shingnapur. Dwarkamai is adjecent to the Sai Baba Samadhi Temple complex. Dwarkamai is the mosque which was used by Sai Baba as his dwelling place for 60 years of his life till his demise in 1918. The mosque was named Dwarkamai by Sai Baba himself and this is the place where many of his miracles were performed and his Durbar was held. Chavadi: Location is next to Dwarkamai .This holy place is situated next to Dwarkamai where Sai Baba used to sleep every alternate night. Sai Baba was taken to Chavadi in a decorated Palkhi by his disciples. The practice of spending alternate nights at Chavadi began on 10th December 1909 which continued until 1918, his Mahanirvan. Today, every Thursday night Baba's footprints are carried from Dwarkamai to Chavadi in a ceremonial procession. Chavadi is a small house which has two rooms. The room in which Baba used to sleep is not accessible to women even today. The Asan (seat) where Sai Baba used to sit and the wooden platform on which his last bath was solemnized after his annihilation are kept in the Chavadi. Shani shignapur: Shani Shignapur is a village located in Ahmednagar District of Maharashtra. It is about 75 km from Shirdi. It will take 2hrs drive from one side.The presiding deity of Shinganapur, Sri Shaneshwara or Lord Shanidev- the personification of the planet Saturn is worshipped with utmost reverence and devotion by multitudes of people from all over the world. The spectacle of the deity in black stone is overwhelming. A unique aspect of this place is, that no temple structure houses the Shanidev. There is only a simple platform on which stands the swayambhu idol, in black stone. Shingnapur village is known not only known for its popular temple of Shani, the Hindu god of planet Saturn, but is also famous for the fact that no house has doors; the fear of god preventing any thefts. Later back to Shirdi, Evening free to attend the Arti at Shirdi Dham. Overnight stay at hotel.